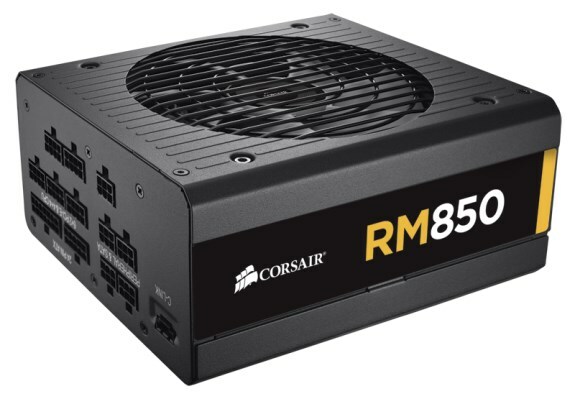 Corsair introduces the RM, a new line of power supplies that focus on ultra-quiet operation. They're available in 450W, 550W, 650W, 750W, 850W and 1000W versions for $99.99, $109.99, $119.99, $129.99, $159.99, and $199.99, respectively. Corsair®, a worldwide designer and supplier of high-performance components to the PC hardware market, today announced the immediate availability of the new ultra-quiet RM Series power supplies (PSUs). The RM Series PSUs replace the TX Series line while adding improved 80 PLUS® Gold level energy efficiency, whisper-quiet operation, and monitoring capability. The RM Series PSUs are available in models with power capacities from 450 to 1000 watts and are compatible with the latest Intel® CoreTM processors codenamed Ivy Bridge E and Haswell. The RM Series PSUs are designed to be exceptionally quiet even when delivering high levels of power. Built with low-noise capacitors and transformers, the PSUs feature a Zero RPM Fan Mode which only spins the PSU fan under the heaviest loads, allowing near silent operation in most everyday usage. The custom designed fan is extremely quiet at all speeds, allowing the PSU to remain remarkably quiet even while the fan is running. Like all Corsair PSUs, the RM Series power supplies are designed with high-quality components and are guaranteed to deliver clean, stable, continuous power. The RM Series PSUs are 80 PLUS Gold rated with energy efficiency up to 90% (92% on 230V AC), reducing energy waste and lowering electrical bills. With a Corsair Digital Bridge cable, included with RM1000 model and optional with other models, RM Series power supplies can be connected to a PC motherboard or a Corsair Link hub for real-time monitoring of fan speed and +12V power delivery via Corsair Link software. The fully modular RM Series PSUs include low-profile black cables, enabling enthusiasts to easily build PCs that are uncluttered and run cooler and quieter. Optional individually sleeved cable kits are available in multiple colors to allow users to customize the look of their PCs. The RM Series PSUs will be available in September from Corsair's worldwide network of authorized distributors and resellers. They are backed with a limited 5-year warranty and Corsair’s excellent customer service and technical support.